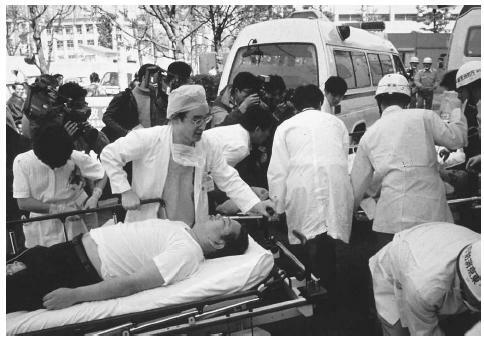 Subway passengers affected by sarin gas planted in central Tokyo subways are carried to the hospital in March 1995. Years after the Aum Shinri cult's terrorist attack in which 11 people were killed and thousands were injured, many victims still suffer physical symptoms from the gas. Iran, Libya, North Korea, and Iraq have confirmed or suspects stocks of sarin. Sarin as a weapon. Iraq produced sarin between 1984 and 1985, when weapons inspectors were ordered to leave the country. Prior to Operation Iraqi Freedom, Iraq had admitted to once having at least 790 tons of the nerve agent. In 1987 and 1988, the United Nations confirmed that Iraq used a combination of organo-phosphorous nerve agents against Kurds in northern Iraq. It is estimated that 5,000 people were killed and 65,000 others were wounded in these attacks. There was also extreme environmental damage. On March 20, 1995, the Aum Shinrikyo doomsday cult released the nerve agent sarin in a Tokyo subway. This incident killed 11 and injured more than 5,500 people. Members of the cult left soft drink containers and lunch boxes filled with the toxin on the floor of subway trains. They punctured the containers with umbrellas just as they exited the cars. The attack was timed for rush hour, so as to affect as many people as possible. Because the sarin was of low quality and the affected cars were quickly sealed once the sarin was detected, the magnitude of the attack was suppressed. Sarin poisoning. Like other organophosphate nerve agents, sarin inhibits the break down of the enzyme acetylcholinesterase. Under normal conditions, this enzyme hydrolyzes the neurotransmitter acetylcholine. When sarin is present, the build up of acetyl-cholinesterase results in the accumulation of excessive concentrations of acetylcholine in nerve synapses. This overstimulates parasympathetic nerves in the smooth muscle of the eyes, respiratory tract, gastrointestinal tract, sweat glands, cardiac muscles, and blood vessels. After exposure to sarin, symptoms begin within minutes. If a person survives for a few hours after exposure, he or she will likely recover from the poisoning. The first symptoms of sarin poisoning include a runny nose, blurred vision, sweating, and muscle twitches. Longer exposures result in tightness of the chest, headache, cramps, nausea, vomiting, involuntary defecation and urination, convulsions, coma, and respiratory arrest. Atropine acts an antidote for nerve agent, including sarin. Atropine binds to one type of acetylcholine receptor on the post-synaptic nerve. A second antidote is pralidoxime iodide (PAM), which blocks sarin from binding to any free acetyl-cholinesterase. Both should be administered as soon as possible following exposure to the toxin. Diazapam can also be used to prevent seizures and convulsions. Soldiers fighting in regions where chemical weapons are likely to be deployed are now equipped with a Mark I antidote kit containing both atropine and PAM. Centers for Disease Control and Prevention: "Facts About Sarin" < http://www.bt.cdc.gov/agent/sarin/basics/facts.asp > (March 25, 2003). Council on Foreign Relations: Terrorism Questions and Answers, "Sarin" < http://www.terrorismanswers.com/weapons/sarin.html > (March 25, 2003). "Sarin Poisoning on Tokyo Subway" < http://www.sma.org/smj/97june3.htm > (March 25, 2003). Does atropine counter sarin gas ? Does the U.S. government publish articles about protective devices such as clothing respiratory equipment so the public can at least maybe have a chance at protection and survival of a sarin gas attack or biological attack in-order for citizens to protect themselves like that of bomb shelters and radiation ?